wool based cloth. If there is a reference to cotton wool or cotton yarn then the reference is to the fibres or thread made from vegetable cotton. Not that many people in England understood how cotton grew. The supposed travel writer Sir John Mandeville, who was probably a Benedictine monk in France regurgitating other writers' works (1) wrote, "There grew [in India] a wonderful tree which bore tiny lambs on the endes of its branches. 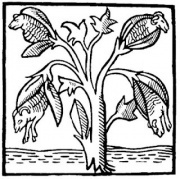 These branches were so pliable that they bent down to allow the lambs to feed when they are hungrie." This resulted in woodcuts such as the one on the right. Fustian, usually though not always, referred to a fabric with a linen warp and a cotton weft and, although the term fustian is actually used much earlier in England than the petition would indicate, Janet Arnold has stated that much of this earlier fustian was imported and consequently expensive (3). Sykas has indicated that some of these early fustians may not have been linen and cotton mix as there is a statue of 1495 regarding the import of deceitfully finished fustians (4). True fustians should have the nap raised and shorn with broadshears, in the deceitful fustians the nap was being singed with candles. 1. Seymour, M. C. ‘Mandeville, Sir John (supp. fl. c.1357)’. Oxford Dictionary of National Biography. [Online] 2004. [Cited: 2 May 2012.] http://www.oxforddnb.com/view/article/17928. 2. To the honorable knights, citizens and burgesses of the Commons House of Parliament the humble petition...buying and selling of fustians made in England.... London : s.n., 1621. 3. Arnold, Janet. Queen Elizabeth's Wardrobe Unlock'd. Leeds : Maney, 1988. 4. Sykas, Philip. Fustians in Englishmen's Dress. Costume. 2009, Vol. 43. 5. Cotgrave, R. Dictionaries of the French and English Tongues. 1611. 6. Smythe, John. Certen Instructions, observations and orders Militarie. London : s.n., 1594.